Lots of gear, great price! Seller Midnightstar assumes all responsibility for the listing and deleting of this ad. Lots of gear at great price! All items are like new. 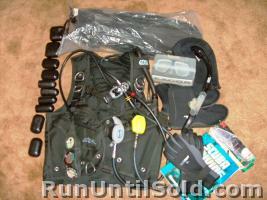 Package includes; Genesis Cobra BCD size XL, Sherwood Blizzard regulater, additional Sherwood reg., Sea Quest Thruster fins size lg/xl, Dacor Integra Goggles, Majave Genesis Snorkle, Genesis Dive Computer, Seasoft gloves size L, mens Parkway Boots size 12, Deep See mask size lg, Underwater Kinectics Sun Light SL6, 4 two pound weights, 2 five pound weights, 4 three pound weights and scuba diving book.